Living in the South Sound usually means at least part of our gardens are somewhere in the shadows. The number one foliage choice for shadow gardening has to be hostas. But hostas need room… a lot of room. They need a good size lot, if not acreage, to be “shown off”. Leaves of popular Hosta ‘Great Expectations’ can reach 1 foot across and the full grown plant of H. ‘Sum and Substance’ can reach 6 feet across. Hostas are spectacular but nearly impossible to grow and display if you garden in an apartment, a condo or in containers. ‘Cat and Mouse’ and ‘Mighty Mouse’. You get the idea. 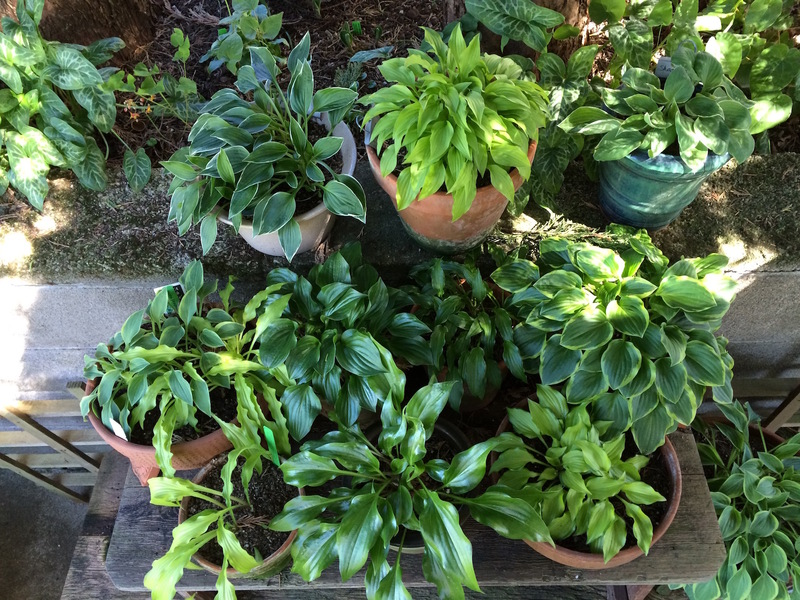 Bottom line…miniature hostas are small enough for a large collection in a very small space. How can you resist growing them when they have names like, ‘Peanut’, ‘Hush Puppie”, ‘Teeny Weeny Bikini’ and ‘Doll House’? Nothing can spoil the look of a home garden like a sea of little “grave markers” plunked in front of every plant. And yet, it’s always nice to know what you planted by marking the plants whose names are likely to be forgotten. There is a simple solution. You know the plastic id tags meant to mark the plants from grower to home garden? Turn them upside down and let the tiny white tip barely show above the soil. Easy to find, the sun won’t destroy the plastic and whether your plant thrives or disappears, you’ll know what it is/was. Proof positive that miniature hostas are gaining in popularity. Timber Press released a new book about them. 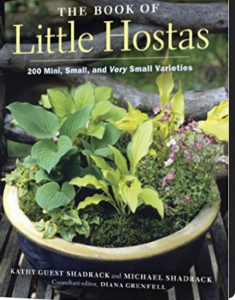 “The Book of Little Hostas” by Michael Shadrack and Kathy Guest Shadrack, is tightly packed with tempting pictures and solid information about the newest plant collector’s craze, miniature hostas. At present, there are more than 300 registered with the American Hosta Society. “The Book of Little Hostas” defines and describes more than 200 miniature hostas in cultivation. According to the authors “little hostas” can be no taller than 12” and no wider than 24”. The true miniature hostas have individual leaves less than 6 square inches. It’s the leaves that are tiny, not the overall plant size. You can get a LOT of miniature hostas in a very small space, which makes collecting them a tempting obsession. If you’re interested at all in the little hostas, the book is worth the price just to see the clever ways the tiny plants are grown and displayed. Plant Saffron Crocus, the most expensive spice in the world.